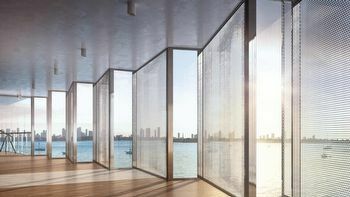 Ateliers Jean Nouvel have composed the landscape specifically to complement the architecture. 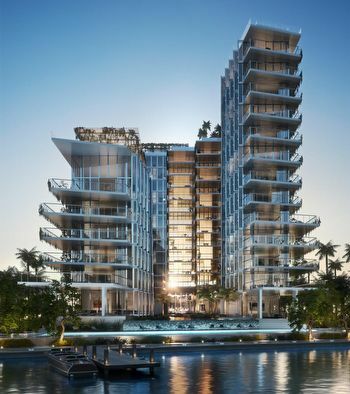 “In the case of Monad Terrace,” Nouvel notes, “it’s not only a building. 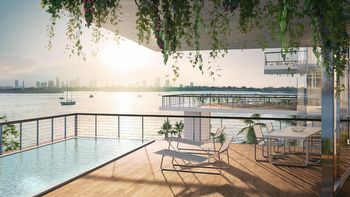 It’s an object belonging to the landscape, and belonging to a sense of place, and a positive part of the identity of that place.” Curated climbing gardens run along the North and South façades of Monad Terrace. 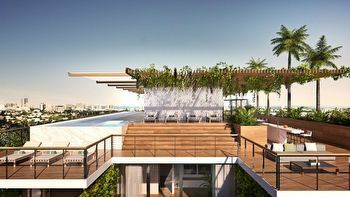 A sheltering cascade of native Bougainvillea, Spanish Moss, Tillandsias, Passion Vine, and other curated species create natural filters and curtains for the terraces behind, bringing the feeling of a living landscape on the North and South sides to the outdoor living area of every residence. 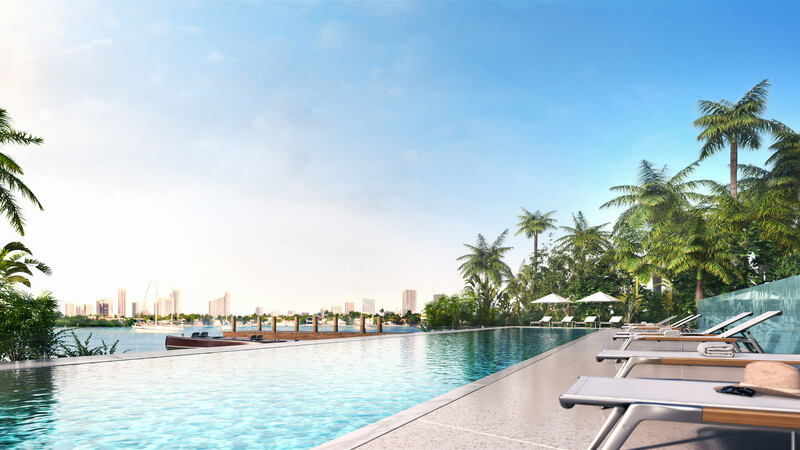 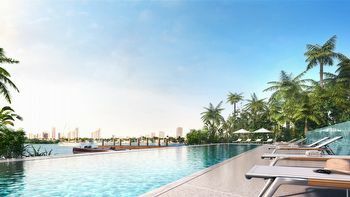 Each of the South Beach condos for sale at Monad Terrace is designed for seamless indoor-outdoor living, with broad and deep terraces going far beyond the conventional balcony to almost double the living space of many residences. 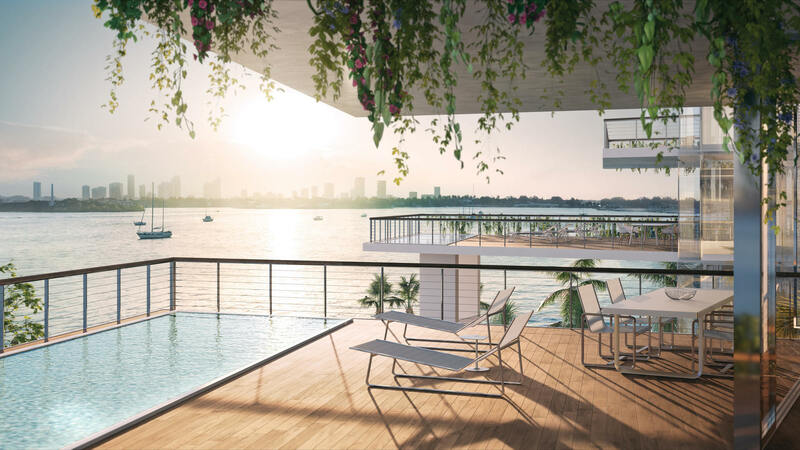 Whether used for dining al fresco, sunbathing, or easy access to multiple interior rooms, the terraces’ spectacular views of the bay and/or South Beach make them a perfect outdoor oasis. 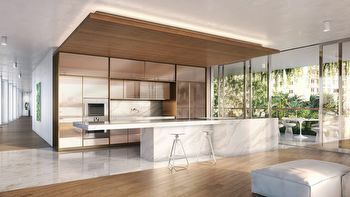 The exclusively designed kitchens by Jean Nouvel establish the sculptural centerpiece of each residence. 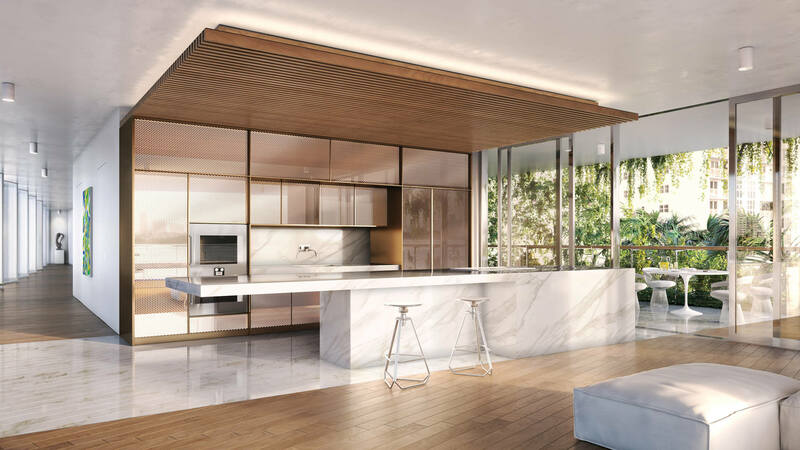 The dramatic cantilevered marble island and fully integrated state-of-the-art appliances synchronize with the wood ceiling and reflective cabinetry. 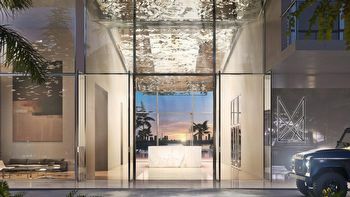 Nouvel’s custom designed bathrooms strike a balance of discretion and boldness. 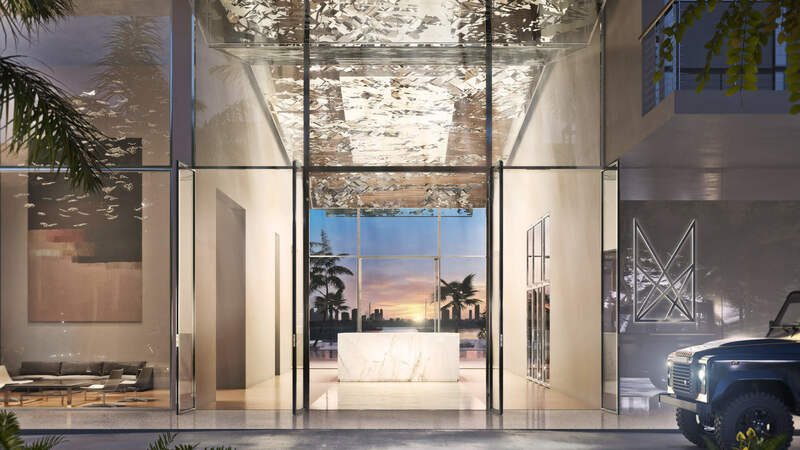 Richly veined, spacious stone countertops, stone tiled walls, and a soaking tub all combine to establish a sanctuary of repose. 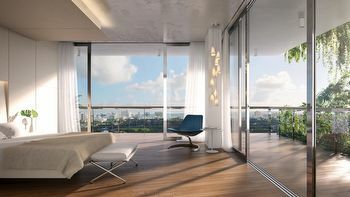 The South Beach condos for sale at Monad Terrace present a limited offering of four exceptional penthouse residences – each a unique expression of Jean Nouvel’s vision. 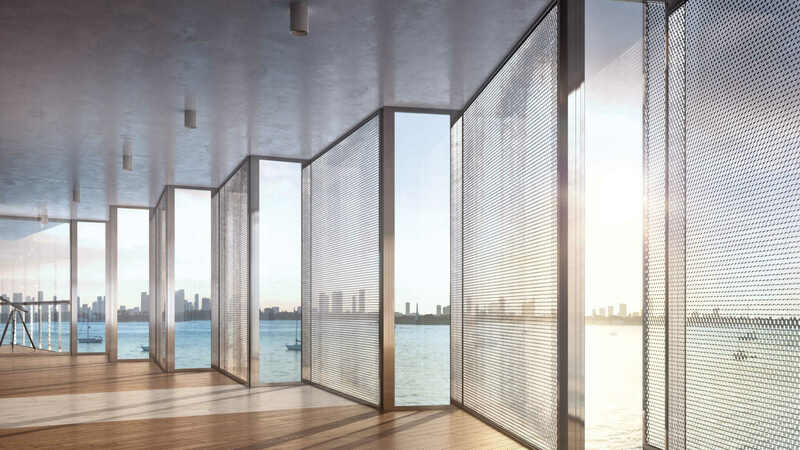 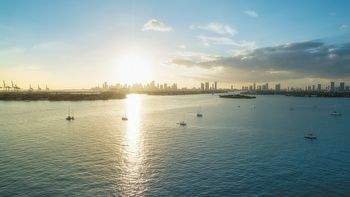 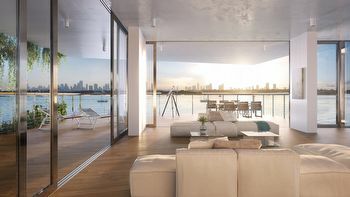 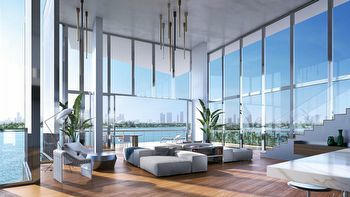 Capturing all the sparkling effects of light and water, penthouses feature Great Rooms with floor-to-ceiling windows framing panoramic views of Biscayne Bay and/or the Atlantic Ocean, as well as private rooftops with pools and dedicated, en-suite elevator access. 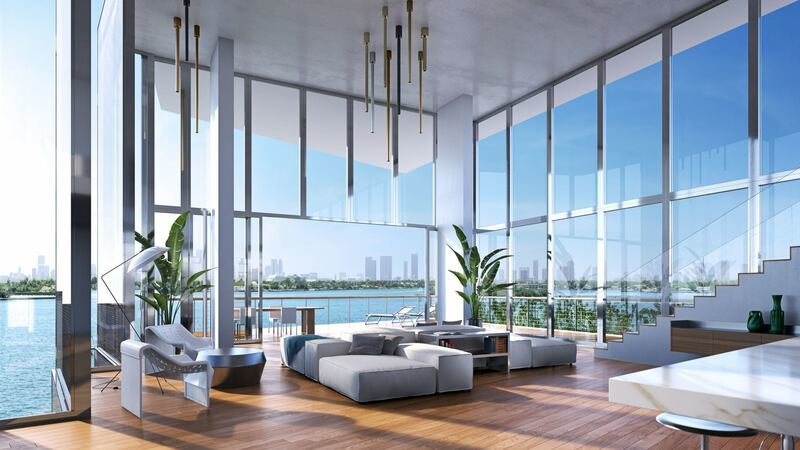 Select penthouses offer soaring double-height ceilings to 20 feet. Master suites have awe-inspiring views, with bay-view soaking tubs in bathrooms and dual closets.